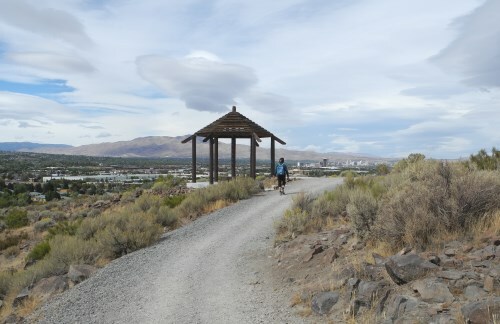 The Huffaker Park Lookout Trail provides a nice stroll around and through a couple of hills adjacent to Huffaker Park in suburban south Reno. It's an oasis of undeveloped land with good views of the surrounding landscape in all directions. The Huffaker Park Lookout Trail has a compacted gravel and decomposed granite tread, making it ADA accessible. It is, however, fairly steep getting up from Huffaker Park to the main trail. The area is managed by the City of Reno. The Huffaker Park Lookout Trail circles around two hills. Hikers can walk around the entire loop or make a figure-8 of it by taking the trail between the hills that connects the outer paths. Though not official, there are obvious use trails to the summit of each hill from the main trail, where you can get even better views. Be sure to look for the informational signs along the way explaining some of the flora, fauna, and geology of the area. If conditions are right, you might see wildflowers such as desert peach in the spring and flowering rabbitbrush in the fall. Once you make the short climb up to the main trail, the path is wide and smooth along the Huffaker Park Lookout Trail. There is a gazebo with benches by the trail on the west side. This is a nice place to take a breather and enjoy the view across the Truckee Meadows. A hike around the entire loop is 1.7 miles. Depending on where you are along the way, you can see just about every corner of the valley. The summits of the two hills give hikers a nearly 360 degree view, from the Virginia Range on the east all the way around to the Carson Range (including Mt. Rose) on the west. From the east, you can see Twin Peaks, the high point reached from the Huffaker Hills Trailhead hiking area. You can get a better idea of the lay of the land from this map of the Huffaker Park Lookout Trail provided by the City of Reno. The trailhead is reached by turning east on E. Huffaker Lake from the main thoroughfare of Longley Lane and going a few blocks, the right on Offenhauser Drive. There is free street parking all around the area. The official address is 1160 E. Huffaker Lane, Reno, NV 89511. You walk through Huffaker Park and cross a small bridge to reach the start of the Huffaker Park Lookout Trail. There are a couple of informational signs telling you about the area and things you can see and enjoy while hiking the trail. Dog walkers take note: Per Washoe County code, dogs must be on leash at all times and owners are responsible for cleaning up their animals' poop. For a hike that is a little more challenging, try the trails from the nearby Huffaker Hills Trailhead. From the highest point on this hike, you can see part of the Huffaker Park Lookout Trail.